Collects Batman: Arkham Origins, Batman: Arkham Knight: Batgirl Begins #1, Batman: Arkham Asylum: The Road to Arkham #1, Batman: Arkham City #1-#5, Batman: Arkham City Digital Chapter #1-#7, Batman: Arkham City: End Game #1, Batman: Arkham Unhinged #1-#20, Batman: Arkham Knight #1-#12, Batman: Arkham Knight: Robin Special #1, Batman: Arkham Knight Annual #1, Batman: Arkham Knight: Batgirl and Harley Quinn #1, Batman: Arkham Knight Genesis #1-6. From the world of the Batman: Arkham Rocksteady video game series comes the graphic novel tales filling in the gaps of the episodes, now collected here in one massive omnibus edition! This huge volume includes every graphic novel ever published in concert with the best-selling, critically acclaimed video games Batman: Arkham Asylum, Batman: Arkham City and Batman: Arkham Knight! Follow the Dark Knight through this amazingly unique take on the world of Gotham City. Explore the stories behind the Joker's death, the birth of the Suicide Squad, the origin of the new Dark Knight and more! 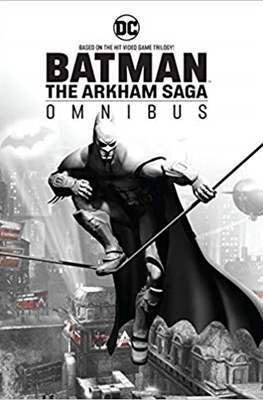 Includes contributions from some of the comics industry elite creators such as Peter J. Tomasi (Batman and Robin, Superman), Paul Dini (Batman: The Animated Series), Karen Traviss (Gears of War, Halo), Derek Fridolfs (Batman, Teen Titans), and Adam Beechen (Teen Titans), this oversize omnibus edition is a must-have for any fan of Batman or the worldwide phenomenon game series !